Annabelle & Colin read the Lancashire Magazine every month and had seen our advert and my monthly. My article is called “how to with JS Decor”. Where each month I explain how we go about the different kind of jobs we get decorative effects. Whilst also talking about painted furniture, hand painted kitchens. From looking at the magazine she then decided to have a look at our extensive website where there’s an abundance of hand painted kitchens and furniture. 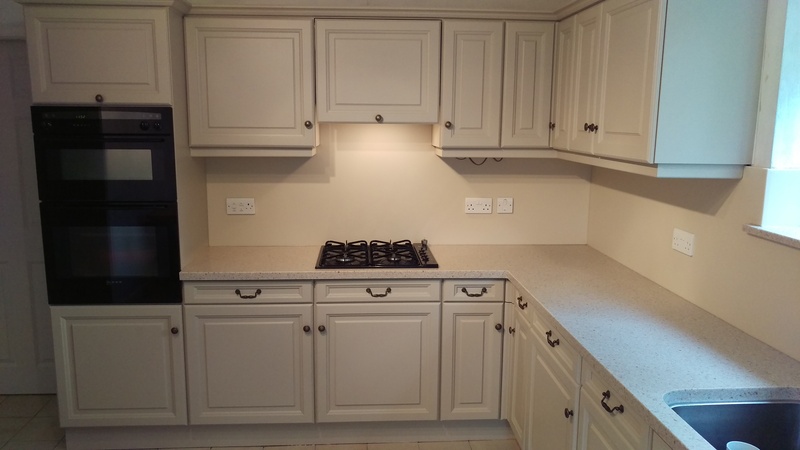 After all her research Annabelle got in touch with a view to changing her kitchen worktops, re-plastering the kitchen walls, then treating the units to a beautiful hand painted finish. I wasn’t very well at the time, so a good colleague of mine Russ Pike in Nottingham was able to price up the kitchen for me via photos. 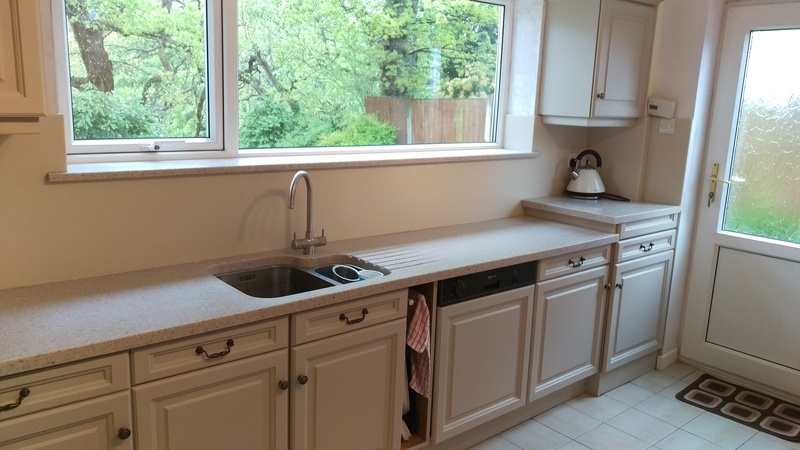 Also Mick Yates our cabinet maker worked with Annabelle to help and advise with replacing the old worktops with Corian, also Corian splash-backs. Wayne also worked for Annabelle for the re-plastering of the kitchen walls. Once the worktops had been decided, matching the paint colour was straightforward. With the worktops fitted we could finalize the colour for the units. There are tons of fabulous colours these days to pick from so finding the correct one isn’t a problem, its just deciding which one. We looked at F&B and also Little Greene. We found that Rolling Fog would be best suited to the Corian. I showed Annabelle and Colin the painted example that I carry around. This shows the sheen level plus the brush less finish we achieve. We always use high performance coatings from Finland on kitchens due to these being a lot more durable than UK based paints. Any colour can be mixed into our finishes whether it’s a satin finish or the duller eggshell equivalent. So first things first, all the hard ware is removed from the units, then we thoroughly de-grease all the kitchen units using citrus based cleaners. Once all the kitchen has been cleaned, it gets a full sand using a dustless sanding system. 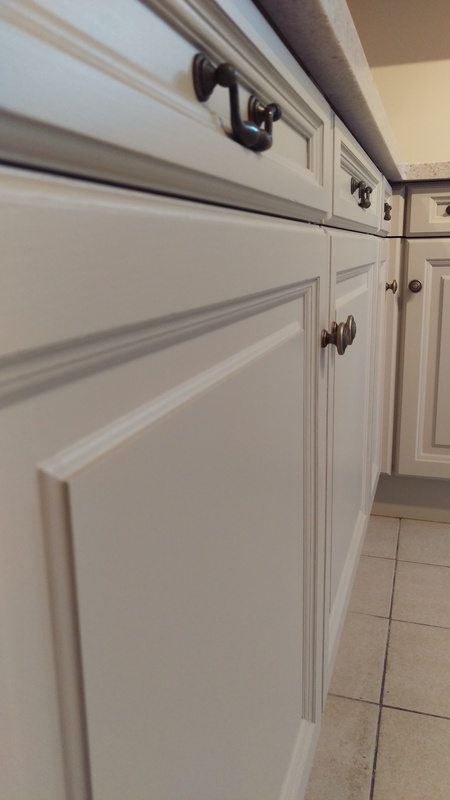 The primers for each kitchen differ, as this was solid Oak we have to use a shellac based primer to stop any tannins ruining the final finish. This is mixed into the same colour as the top coat, which improves the coverage. Once all the units are primed, two top coats are applied. 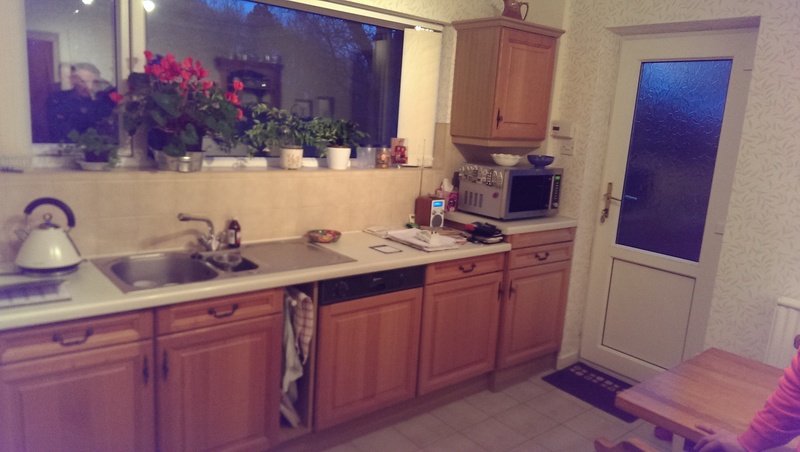 We are delighted with how our dated kitchen has been transformed by the two Matts. Jason was extremely helpful in guiding us to our final colour choice for the kitchen to coordinate with our new worktops and splash backs, and although slightly apprehensive after deciding from a tiny colour swatch. Jason’s recommendation is absolutely right. We would like to thank Annabelle and Colin for their kindness whilst we went about the transformation of their kitchen. If your looking to have a kitchen or some furniture re vamped or just painted. JS Decor are your first port of call in Lancashire or Cheshire. For more hints & tips check out our monthly how to with JS Decor in The Lancashire Magazine.